The perfect gift is on sale at Zazzle today!! 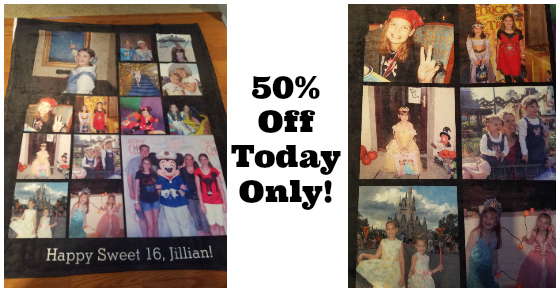 50% off fleece blankets with code ZCUSTOMGIFTS. I actually ordered one for my daughter for her Sweet 16 earlier this month because I wanted something unique for her. She LOVED it. (I used Disney pictures of her over her whole life). You can bet I will be spending today ordering some last minute Christmas gifts at this price! You can make them as simple or as complicated as you want. Use just a name on a background or go crazy like I did and upload up to 14 photos. The quality is great and the gift is one that they will keep forever. They have several templates to choose from. This deal ends Wednesday night at midnight!